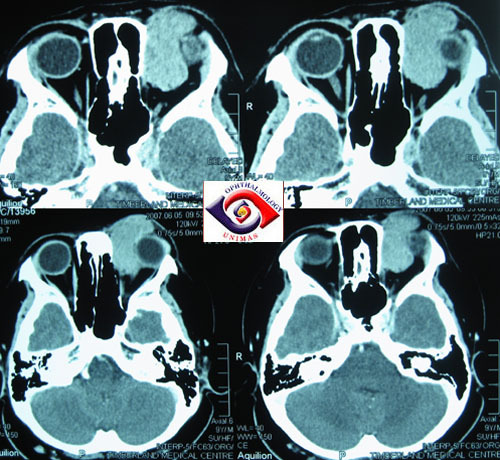 A 9 year-old boy presented with a 5-year history of progressive painless closure of the left upper eyelid (Figure 1). The vision was 6/6 in both eyes. There was a bluish discoloration over the medial aspect of the left upper eyelid. The eyelid was soft too touch and showed no transillumination. The left globe showed non-axial proptosis in a down-and-out position which was not reducible with palpation and did not change in size with position or Valsalva's maneuver. The left eye also showed limited adduction and upgaze (Figure 2). Figure 1. Left complete ptosis with bluish discoloration of the left medial upper eyelid. Figure 2. Restricted left upgaze and adduction. 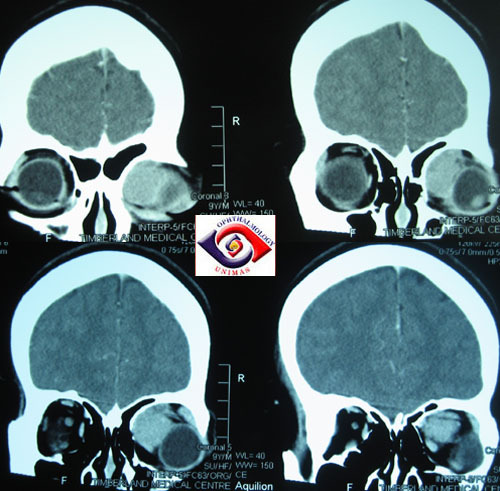 CT scan showed a large hyperdense soft tissue mass on the anteromedial aspect of the left orbit that extended anteriorly into the upper eyelid A blood fluid fluid level was present in one of the axial scans (Figure 3). The lesion involves both the extra and intraconal space and measures about 2.2 X 4.5 cm in axial dimensions. It partially engulfed the left medial and superior recti (Figure 4 and 5). A MRI scan was requested but not done because the patient was claustrophobic. Figure 3. A blood fluid level is evident in this axial CT scan. superior recti are closely associated with the lesion. Figure 5. 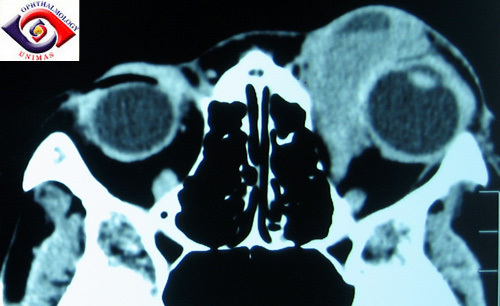 Coronal scans of the lesion. a. What is the differential diagnosis of this lesion? What is the most likely diagnosis? b. Which surgical technique is best employed to excise the tumour?